IN a large and pleasant garden sat little Annie all alone, and she seemed very sad, for drops that were not dew fell fast upon the flowers beside her, who looked wonderingly up, and bent still nearer, as if they longed to cheer and comfort her. The warm wind lifted up her shining hair and softly kissed her cheek, while the sunbeams, looking most kindly in her face, made little rainbows in her tears, and lingered lovingly about her. But Annie paid no heed to sun, or wind, or flower; still the bright tears fell, and she forgot all but her sorrow. "Little Annie, tell me why you weep," said a low voice in her ear; and, looking up, the child beheld a little figure standing on a vine-leaf at her side; a lovely face smiled on her, from amid bright locks of hair, and shining wings were folded on a white and glittering robe, that fluttered in the wind. "Who are you, lovely little thing?" cried Annie, smiling through her tears. "I am a Fairy, little child, and am come to help and comfort you; now tell me why you weep, and let me be your friend," replied the spirit, as she smiled more kindly still on Annie's wondering face. "And are you really, then, a little Elf, such as I read of in my fairy books? Do you ride on butterflies, sleep in flower-cups, and live among the clouds?" "Yes, all these things I do, and many stranger still, that all your fairy books can never tell; but now, dear Annie," said the Fairy, bending nearer, "tell me why I found no sunshine on your face; why are these great drops shining on the flowers, and why do you sit alone when BIRD and BEE are calling you to play?" "Ah, you will not love me any more if I should tell you all," said Annie, while the tears began to fall again; "I am not happy, for I am not good; how shall I learn to be a patient, gentle child? good little Fairy, will you teach me how?" "Gladly will I aid you, Annie, and if you truly wish to be a happy child, you first must learn to conquer many passions that you cherish now, and make your heart a home for gentle feelings and happy thoughts; the task is hard, but I will give this fairy flower to help and counsel you. Bend hither, that I may place it in your breast; no hand can take it hence, till I unsay the spell that holds it there." As thus she spoke, the Elf took from her bosom a graceful flower, whose snow-white leaves shone with a strange, soft light. "This is a fairy flower," said the Elf, "invisible to every eye save yours; now listen while I tell its power, Annie. When your heart is filled with loving thoughts, when some kindly deed has been done, some duty well performed, then from the flower there will arise the sweetest, softest fragrance, to reward and gladden you. But when an unkind word is on your lips, when a selfish, angry feeling rises in your heart, or an unkind, cruel deed is to be done, then will you hear the soft, low chime of the flower-bell; listen to its warning, let the word remain unspoken, the deed undone, and in the quiet joy of your own heart, and the magic perfume of your bosom flower, you will find a sweet reward." "O kind and generous Fairy, how can I ever thank you for this lovely gift!" cried Annie. "I will be true, and listen to my little bell whenever it may ring. But shall I never see YOU more? Ah! if you would only stay with me, I should indeed be good." "I cannot stay now, little Annie," said the Elf, "but when another Spring comes round, I shall be here again, to see how well the fairy gift has done its work. And now farewell, dear child; be faithful to yourself, and the magic flower will never fade." Then the gentle Fairy folded her little arms around Annie's neck, laid a soft kiss on her cheek, and, spreading wide her shining wings, flew singing up among the white clouds floating in the sky. And little Annie sat among her flowers, and watched with wondering joy the fairy blossom shining on her breast. The pleasant days of Spring and Summer passed away, and in little Annie's garden Autumn flowers were blooming everywhere, with each day's sun and dew growing still more beautiful and bright; but the fairy flower, that should have been the loveliest of all, hung pale and drooping on little Annie's bosom; its fragrance seemed quite gone, and the clear, low music of its warning chime rang often in her ear. When first the Fairy placed it there, she had been pleased with her new gift, and for a while obeyed the fairy bell, and often tried to win some fragrance from the flower, by kind and pleasant words and actions; then, as the Fairy said, she found a sweet reward in the strange, soft perfume of the magic blossom, as it shone upon her breast; but selfish thoughts would come to tempt her, she would yield, and unkind words fell from her lips; and then the flower drooped pale and scentless, the fairy bell rang mournfully, Annie would forget her better resolutions, and be again a selfish, wilful little child. At last she tried no longer, but grew angry with the faithful flower, and would have torn it from her breast; but the fairy spell still held it fast, and all her angry words but made it ring a louder, sadder peal. Then she paid no heed to the silvery music sounding in her ear, and each day grew still more unhappy, discontented, and unkind; so, when the Autumn days came round, she was no better for the gentle Fairy's gift, and longed for Spring, that it might be returned; for now the constant echo of the mournful music made her very sad. One sunny morning, when the fresh, cool Winds were blowing, and not a cloud was in the sky, little Annie walked among her flowers, looking carefully into each, hoping thus to find the Fairy, who alone could take the magic blossom from her breast. But she lifted up their drooping leaves, peeped into their dewy cups in vain; no little Elf lay hidden there, and she turned sadly from them all, saying, "I will go out into the fields and woods, and seek her there. I will not listen to this tiresome music more, nor wear this withered flower longer." So out into the fields she went, where the long grass rustled as she passed, and timid birds looked at her from their nests; where lovely wild-flowers nodded in the wind, and opened wide their fragrant leaves, to welcome in the murmuring bees, while butterflies, like winged flowers, danced and glittered in the sun. Little Annie looked, searched, and asked them all if any one could tell her of the Fairy whom she sought; but the birds looked wonderingly at her with their soft, bright eyes, and still sang on; the flowers nodded wisely on their stems, but did not speak, while butterfly and bee buzzed and fluttered away, one far too busy, the other too idle, to stay and tell her what she asked. Then she went through broad fields of yellow grain, that waved around her like a golden forest; here crickets chirped, grasshoppers leaped, and busy ants worked, but they could not tell her what she longed to know. "Now will I go among the hills," said Annie, "she may be there." So up and down the green hill-sides went her little feet; long she searched and vainly she called; but still no Fairy came. Then by the river-side she went, and asked the gay dragon-flies, and the cool white lilies, if the Fairy had been there; but the blue waves rippled on the white sand at her feet, and no voice answered her. Then into the forest little Annie went; and as she passed along the dim, cool paths, the wood-flowers smiled up in her face, gay squirrels peeped at her, as they swung amid the vines, and doves cooed softly as she wandered by; but none could answer her. So, weary with her long and useless search, she sat amid the ferns, and feasted on the rosy strawberries that grew beside her, watching meanwhile the crimson evening clouds that glowed around the setting sun. 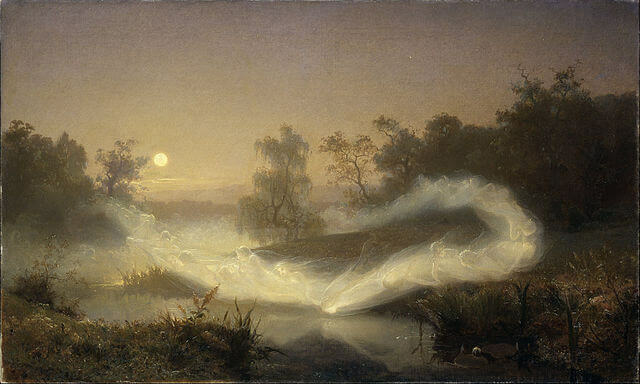 The night-wind rustled through the boughs, rocking the flowers to sleep; the wild birds sang their evening hymns, and all within the wood grew calm and still; paler and paler grew the purple light, lower and lower drooped little Annie's head, the tall ferns bent to shield her from the dew, the whispering pines sang a soft lullaby; and when the Autumn moon rose up, her silver light shone on the child, where, pillowed on green moss, she lay asleep amid the wood-flowers in the dim old forest. And all night long beside her stood the Fairy she had sought, and by elfin spell and charm sent to the sleeping child this dream. "Little Annie, look and see the evil things that you are cherishing; I will clothe in fitting shapes the thoughts and feelings that now dwell within your heart, and you shall see how great their power becomes, unless you banish them for ever." Then Annie saw, with fear and wonder, that the angry words she uttered changed to dark, unlovely forms, each showing plainly from what fault or passion it had sprung. Some of the shapes had scowling faces and bright, fiery eyes; these were the spirits of Anger. Others, with sullen, anxious looks, seemed gathering up all they could reach, and Annie saw that the more they gained, the less they seemed to have; and these she knew were shapes of Selfishness. Spirits of Pride were there, who folded their shadowy garments round them, and turned scornfully away from all the rest. These and many others little Annie saw, which had come from her own heart, and taken form before her eyes. When first she saw them, they were small and weak; but as she looked they seemed to grow and gather strength, and each gained a strange power over her. She could not drive them from her sight, and they grew ever stronger, darker, and more unlovely to her eyes. They seemed to cast black shadows over all around, to dim the sunshine, blight the flowers, and drive away all bright and lovely things; while rising slowly round her Annie saw a high, dark wall, that seemed to shut out everything she loved; she dared not move, or speak, but, with a strange fear at her heart, sat watching the dim shapes that hovered round her. Higher and higher rose the shadowy wall, slowly the flowers near her died, lingeringly the sunlight faded; but at last they both were gone, and left her all alone behind the gloomy wall. Then the spirits gathered round her, whispering strange things in her ear, bidding her obey, for by her own will she had yielded up her heart to be their home, and she was now their slave. Then she could hear no more, but, sinking down among the withered flowers, wept sad and bitter tears, for her lost liberty and joy; then through the gloom there shone a faint, soft light, and on her breast she saw her fairy flower, upon whose snow-white leaves her tears lay shining. Clearer and brighter grew the radiant light, till the evil spirits turned away to the dark shadow of the wall, and left the child alone. The light and perfume of the flower seemed to bring new strength to Annie, and she rose up, saying, as she bent to kiss the blossom on her breast, "Dear flower, help and guide me now, and I will listen to your voice, and cheerfully obey my faithful fairy bell." Then in her dream she felt how hard the spirits tried to tempt and trouble her, and how, but for her flower, they would have led her back, and made all dark and dreary as before. Long and hard she struggled, and tears often fell; but after each new trial, brighter shone her magic flower, and sweeter grew its breath, while the spirits lost still more their power to tempt her. Meanwhile, green, flowering vines crept up the high, dark wall, and hid its roughness from her sight; and over these she watched most tenderly, for soon, wherever green leaves and flowers bloomed, the wall beneath grew weak, and fell apart. Thus little Annie worked and hoped, till one by one the evil spirits fled away, and in their place came shining forms, with gentle eyes and smiling lips, who gathered round her with such loving words, and brought such strength and joy to Annie's heart, that nothing evil dared to enter in; while slowly sank the gloomy wall, and, over wreaths of fragrant flowers, she passed out into the pleasant world again, the fairy gift no longer pale and drooping, but now shining like a star upon her breast. Then the low voice spoke again in Annie's sleeping ear, saying, "The dark, unlovely passions you have looked upon are in your heart; watch well while they are few and weak, lest they should darken your whole life, and shut out love and happiness for ever. Remember well the lesson of the dream, dear child, and let the shining spirits make your heart their home." And with that voice sounding in her ear, little Annie woke to find it was a dream; but like other dreams it did not pass away; and as she sat alone, bathed in the rosy morning light, and watched the forest waken into life, she thought of the strange forms she had seen, and, looking down upon the flower on her breast, she silently resolved to strive, as she had striven in her dream, to bring back light and beauty to its faded leaves, by being what the Fairy hoped to render her, a patient, gentle little child. And as the thought came to her mind, the flower raised its drooping head, and, looking up into the earnest little face bent over it, seemed by its fragrant breath to answer Annie's silent thought, and strengthen her for what might come. Meanwhile the forest was astir, birds sang their gay good-morrows from tree to tree, while leaf and flower turned to greet the sun, who rose up smiling on the world; and so beneath the forest boughs and through the dewy fields went little Annie home, better and wiser for her dream. Autumn flowers were dead and gone, yellow leaves lay rustling on the ground, bleak winds went whistling through the naked trees, and cold, white Winter snow fell softly down; yet now, when all without looked dark and dreary, on little Annie's breast the fairy flower bloomed more beautiful than ever. The memory of her forest dream had never passed away, and through trial and temptation she had been true, and kept her resolution still unbroken; seldom now did the warning bell sound in her ear, and seldom did the flower's fragrance cease to float about her, or the fairy light to brighten all whereon it fell. So better and happier grew the child, fairer and sweeter grew the flower, till Spring came smiling over the earth, and woke the flowers, set free the streams, and welcomed back the birds; then daily did the happy child sit among her flowers, longing for the gentle Elf to come again, that she might tell her gratitude for all the magic gift had done. At length, one day, as she sat singing in the sunny nook where all her fairest flowers bloomed, weary with gazing at the far-off sky for the little form she hoped would come, she bent to look with joyful love upon her bosom flower; and as she looked, its folded leaves spread wide apart, and, rising slowly from the deep white cup, appeared the smiling face of the lovely Elf whose coming she had waited for so long. "Dear Annie, look for me no longer; I am here on your own breast, for you have learned to love my gift, and it has done its work most faithfully and well," the Fairy said, as she looked into the happy child's bright face, and laid her little arms most tenderly about her neck. "And now have I brought another gift from Fairy-Land, as a fit reward for you, dear child," she said, when Annie had told all her gratitude and love; then, touching the child with her shining wand, the Fairy bid her look and listen silently. And suddenly the world seemed changed to Annie; for the air was filled with strange, sweet sounds, and all around her floated lovely forms. In every flower sat little smiling Elves, singing gayly as they rocked amid the leaves. On every breeze, bright, airy spirits came floating by; some fanned her cheek with their cool breath, and waved her long hair to and fro, while others rang the flower-bells, and made a pleasant rustling among the leaves. In the fountain, where the water danced and sparkled in the sun, astride of every drop she saw merry little spirits, who plashed and floated in the clear, cool waves, and sang as gayly as the flowers, on whom they scattered glittering dew. The tall trees, as their branches rustled in the wind, sang a low, dreamy song, while the waving grass was filled with little voices she had never heard before. Butterflies whispered lovely tales in her ear, and birds sang cheerful songs in a sweet language she had never understood before. Earth and air seemed filled with beauty and with music she had never dreamed of until now. "O tell me what it means, dear Fairy! is it another and a lovelier dream, or is the earth in truth so beautiful as this?" she cried, looking with wondering joy upon the Elf, who lay upon the flower in her breast. "Yes, it is true, dear child," replied the Fairy, "and few are the mortals to whom we give this lovely gift; what to you is now so full of music and of light, to others is but a pleasant summer world; they never know the language of butterfly or bird or flower, and they are blind to all that I have given you the power to see. These fair things are your friends and playmates now, and they will teach you many pleasant lessons, and give you many happy hours; while the garden where you once sat, weeping sad and bitter tears, is now brightened by your own happiness, filled with loving friends by your own kindly thoughts and feelings; and thus rendered a pleasant summer home for the gentle, happy child, whose bosom flower will never fade. And now, dear Annie, I must go; but every Springtime, with the earliest flowers, will I come again to visit you, and bring some fairy gift. Guard well the magic flower, that I may find all fair and bright when next I come." Then, with a kind farewell, the gentle Fairy floated upward through the sunny air, smiling down upon the child, until she vanished in the soft, white clouds, and little Annie stood alone in her enchanted garden, where all was brightened with the radiant light, and fragrant with the perfume of her fairy flower.